Ansonia Local Schools broke ground Friday on its $2.8 million Preschool and Athletic Fieldhouse project. The school board, administration, faculty, students and members of the community were on hand to see the construction site and thank donors. 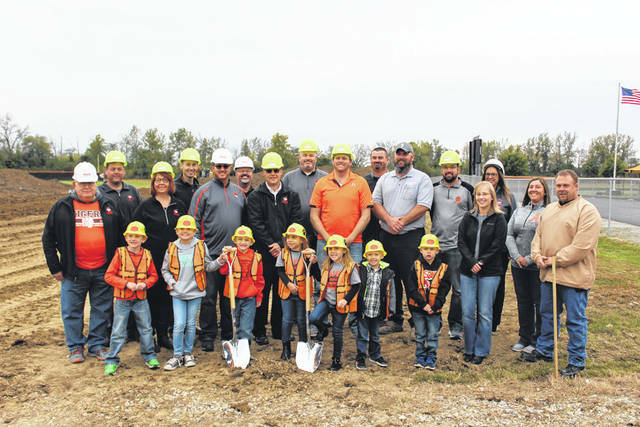 ANSONIA — With earth-moving equipment already pushing dirt, the Ansonia community turned out Friday to celebrate the groundbreaking of Ansonia Local Schools’ new Preschool and Athletic Fieldhouse facility. Eighty-five percent of the $2.8 million project is being funded by the school district while 15 percent is being funded through donations from the community. Bruns Construction is performing the work. With a scheduled completion date of July 1, 2019, the facility will feature 7,296 square feet of space for the preschool and a 14,800-square-foot athletic fieldhouse. Daryl Riffle thanked the project’s Superior Level donors ($25,000 or more) and Exceptional Level donors ($15,000 to $24,999). Board Member and Fundraising Chairman Ron Barga II said $411,000 of the $500,000 private fundraising goal has been achieved. Superintendent Jim Atchley said the district, in partnership with Ansonia United Methodist Church, currently serves 96 preschool students and said some students were turned away from the program this year for lack of space. “We’re hopeful with this new building, and being able to have four classrooms, we will not have to do that [again],” he said. To track progress of the new facility, visit the Ansonia Preschool & Athletic Fieldhouse Facebook page. To donate to the project, a personal or corporate check can be mailed to Ansonia Local School District, P.O. Box 279, Ansonia, OH 45303. The writer may be reached at 937-569-4314. Join the conversation and get updates on Facebook search Darke County Sports or Advocate 360. For more features online go to dailyadvocate.com. This entry was tagged Ansonia, Ansonia Local School, Ansonia Preschool & Athletic Fieldhouse, Bruns Construction, groundbreaking. Bookmark the permalink.